A geocentric orbit or Earth orbit involves any object orbiting Planet Earth, such as the Moon or artificial satellites. In 1997 NASA estimated there were approximately 2,465 artificial satellite payloads orbiting the Earth and 6,216 pieces of space debris as tracked by the Goddard Space Flight Center. Over 16,291 previously launched objects have decayed into the Earth's atmosphere. There is a large variety of other sources    that define LEO in terms of altitude. The altitude of an object in an elliptic orbit can vary significantly along the orbit. Even for circular orbits, the altitude above ground can vary by as much as 30 km (19 mi) (especially for polar orbits) due to the oblateness of Earth's spheroid figure and local topography. While definitions in terms of altitude are inherently ambiguous, most of them fall within the range specified by an orbit period of 128 minutes because, according to Kepler's third law, this corresponds to a semi-major axis of 8,413 km (5,228 mi). For circular orbits, this in turn corresponds to an altitude of 2,042 km (1,269 mi) above the mean radius of Earth, which is consistent with some of the upper limits in the LEO definitions in terms of altitude. In astrodynamics or celestial mechanics, an elliptic orbit or elliptical orbit is a Kepler orbit with an eccentricity of less than 1; this includes the special case of a circular orbit, with eccentricity equal to 0. In a stricter sense, it is a Kepler orbit with the eccentricity greater than 0 and less than 1. In a wider sense, it is a Kepler orbit with negative energy. This includes the radial elliptic orbit, with eccentricity equal to 1. A circular orbit is the orbit with a fixed distance around the barycenter, that is, in the shape of a circle. A polar orbit is one in which a satellite passes above or nearly above both poles of the body being orbited on each revolution. It therefore has an inclination of 90 degrees to the body's equator. A satellite in a polar orbit will pass over the equator at a different longitude on each of its orbits. The LEO region is defined by some sources as the region in space that LEO orbits occupy. Some highly elliptical orbits may pass through the LEO region near their lowest altitude (or perigee) but are not in an LEO Orbit because their highest altitude (or apogee) exceeds 2,000 km (1,200 mi). Sub-orbital objects can also reach the LEO region but are not in an LEO orbit because they re-enter the atmosphere. The distinction between LEO orbits and the LEO region is especially important for analysis of possible collisions between objects which may not themselves be in LEO but could collide with satellites or debris in LEO orbits. A highly elliptical orbit (HEO) is an elliptic orbit with high eccentricity, usually referring to one around Earth. Examples of inclined HEO orbits include Molniya orbits, named after the Molniya Soviet communication satellites which used them, and tundra orbits. Delta-v, symbolised as ∆v and pronounced delta-vee, as used in spacecraft flight dynamics, is a measure of the impulse that is needed to perform a maneuver such as launch from, or landing on a planet or moon, or in-space orbital maneuver. It is a scalar that has the units of speed. As used in this context, it is not the same as the physical change in velocity of the vehicle. In astrodynamics and rocketry, gravity drag is a measure of the loss in the net performance of a rocket while it is thrusting in a gravitational field. In other words, it is the cost of having to hold the rocket up in a gravity field. Weightlessness is the complete or near-complete absence of the sensation of weight. This is also termed zero-g, although the more correct term is "zero g-force." It occurs in the absence of any contact forces upon objects including the human body. Earth observation satellites and spy satellites use LEO as they are able to see the surface of the Earth clearly by being close to it. They are also able to traverse the surface of the Earth. A majority of artificial satellites are placed in LEO,  making one complete revolution around the Earth in about 90 minutes. The International Space Station is in a LEO about 330 km (210 mi) to 420 km (260 mi) above Earth's surface,  and needs reboosting a few times a year due to orbital decay. A space elevator is a proposed type of planet-to-space transportation system. The main component would be a cable anchored to the surface and extending into space. The design would permit vehicles to travel along the cable from a planetary surface, such as the Earth's, directly into space or orbit, without the use of large rockets. An Earth-based space elevator would consist of a cable with one end attached to the surface near the equator and the other end in space beyond geostationary orbit. The competing forces of gravity, which is stronger at the lower end, and the outward/upward centrifugal force, which is stronger at the upper end, would result in the cable being held up, under tension, and stationary over a single position on Earth. With the tether deployed, climbers could repeatedly climb the tether to space by mechanical means, releasing their cargo to orbit. Climbers could also descend the tether to return cargo to the surface from orbit. 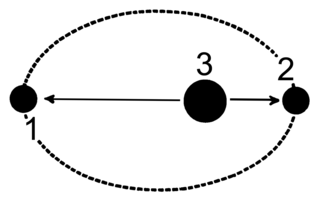 In orbital mechanics, the Hohmann transfer orbit is an elliptical orbit used to transfer between two circular orbits of different radii in the same plane. In general a Hohmann transfer orbit uses the lowest possible amount of energy in traveling between two objects orbiting at these radii, and so is used to send the maximum amount of mission payload with the fixed amount of energy that can be imparted by a particular rocket. 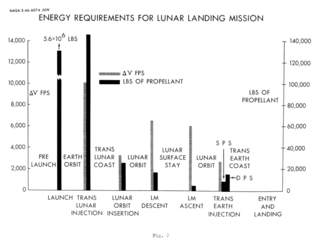 Non-Hohmann transfer paths may have other advantages for a particular mission such as shorter transfer times, but will necessarily require a reduction in payload mass and/or use of a more powerful rocket. An orbital spaceflight is a spaceflight in which a spacecraft is placed on a trajectory where it could remain in space for at least one orbit. To do this around the Earth, it must be on a free trajectory which has an altitude at perigee above 100 kilometers (62 mi); this is, by at least one convention, the boundary of space. To remain in orbit at this altitude requires an orbital speed of ~7.8 km/s. 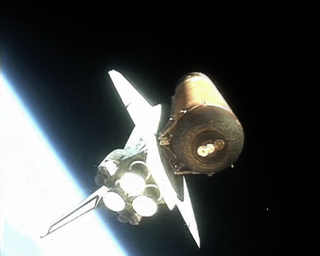 Orbital speed is slower for higher orbits, but attaining them requires greater delta-v.
A space gun, sometimes called a Verne gun because of its appearance in From the Earth to the Moon by Jules Verne, is a method of launching an object into space using a large gun- or cannonlike structure. Space guns could thus potentially provide a method of non-rocket spacelaunch. It has been conjectured that space guns could place satellites into Earth's orbit, and could also launch spacecraft beyond Earth's gravitational pull and into other parts of the Solar System by exceeding Earth's escape velocity of about 11.2 km/s or 40,320 km/h (25,050 mph). However, these speeds are too far into the hypersonic range for most practical propulsion systems and also would cause most objects to burn up due to aerodynamic heating or be torn apart by aerodynamic drag. Therefore, a more likely future use of space guns would be to launch objects into near Earth orbit, from where attached rockets could be fired or the objects could be "collected" by maneuverable orbiting satellites. 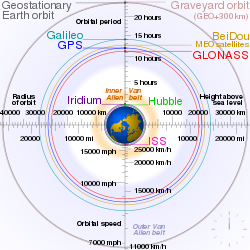 A graveyard orbit, also called a junk orbit or disposal orbit, is an orbit that lies away from common operational orbits. One significant graveyard orbit is a supersynchronous orbit well above geosynchronous orbit. 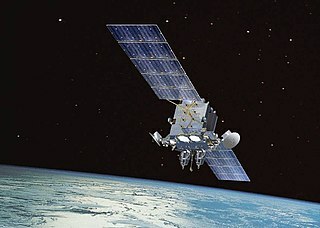 Satellites are typically moved into such orbits at the end of their operational life to reduce the probability of colliding with operational spacecraft and generating space debris. The Kessler syndrome, proposed by the NASA scientist Donald J. Kessler in 1978, is a scenario in which the density of objects in low Earth orbit (LEO) is high enough that collisions between objects could cause a cascade where each collision generates space debris that increases the likelihood of further collisions. One implication is that the distribution of debris in orbit could render space activities and the use of satellites in specific orbital ranges impractical for many generations. ↑ Sampaio, Jarbas; Wnuk, Edwin; Vilhena de Moraes, Rodolpho; Fernandes, Sandro (2014-01-01). "Resonant Orbital Dynamics in LEO Region: Space Debris in Focus". Mathematical Problems in Engineering. 2014: Figure 1: Histogram of the mean motion of the cataloged objects. doi:10.1155/2014/929810. ↑ "Resonant Orbital Dynamics in LEO Region: Space Debris in Focus : Figure 1". www.hindawi.com. Retrieved 2018-07-13. ↑ "Definition of LOW EARTH ORBIT". www.merriam-webster.com. Retrieved 2018-07-08. ↑ "Frequently Asked Questions". www.faa.gov. Retrieved 2018-07-08. LEO refers to orbits that are typically less than 2,400 km (1,491 mi) in altitude. ↑ Campbell, Ashley (2015-07-10). "SCaN Glossary". NASA. Retrieved 2018-07-12. Low Earth Orbit (LEO): A geocentric orbit with an altitude much less than the Earth's radius. Satellites in this orbit are between 80 and 2000 kilometers above the Earth's surface. ↑ "What Is an Orbit?". NASA. David Hitt : NASA Educational Technology Services, Alice Wesson : JPL, J.D. Harrington : HQ;, Larry Cooper : HQ;, Flint Wild : MSFC;, Ann Marie Trotta : HQ;, Diedra Williams : MSFC;. 2015-06-01. Retrieved 2018-07-08. LEO is the first 100 to 200 miles (161 to 322 km) of space. ↑ "LEO parameters". www.spaceacademy.net.au. Retrieved 2015-06-12. ↑ Swinerd, Graham (2008). How Spacecraft Fly. Praxis Publishing. pp. 103–104. ISBN 0387765727. ↑ Messier, Doug (2017-03-03). "SpaceX Wants to Launch 12,000 Satellites". Parabolic Arc. Retrieved 2018-01-22. ↑ Holli, Riebeek, (2009-09-04). "NASA Earth Observatory :". earthobservatory.nasa.gov. Retrieved 2015-11-28. ↑ "Higher Altitude Improves Station's Fuel Economy". NASA. Retrieved 2013-02-12.